Al’s (très impressive) battle with Pride and Kimblee in this episode is more than just Philosopher Stone one-upmanship; it’s a battle about choices between characters who have decided to tread the steadfast path of selfishness (Kimblee, Pride) and selflessness (Al, Heinkel, Marcoh). FMA1 never delves too deeply into intent, as most of its characters wear it on their proverbial sleeves. Because all of the main FMA1 characters are looking for resolutions to their own problems, only selfish motives can be derived from their actions. So battles betwixt characters can take on no other connotation than psyche vs. psyche, which is, after all, the heart of FMA1. But FMA2 uses battles as manifestations of confrontation to address conflicts of social and biological evolution. Depiction of action (fight sequences in general) in FMA2 has always stood way far in front of FMA1, and the aforementioned battle is no different. However, there is a moment that harkens back to FMA1-style battles of psychoanalysis-evoking stratagem. 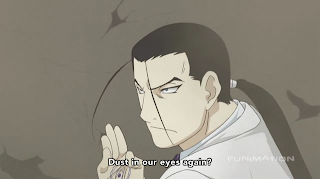 The moment I speak of is Kimblee talking to Al in the midst of a battle, preying on his frustration over lack of choices for himself and his brother (restoring their bodies or saving everyone). But here, FMA2 actually does one better than FMA1 and manages to apply the conversation to a poignant event in the battle: Kimblee’s (second) freeing of Pride from his Earthy prison. What FMA2 doesn’t manage to get the better of in this episode, concerning FMA1, is background music during the Kimblee and Al fight. I’m assuming the producers wanted something European sounding, something close to a waltz perhaps to show the careful steps between opponents, but the writing carries the conversation so well and with so much tension due to Kimblee’s malicious intent that in truth any background music would be superfluous. So what results is amped-up music that almost mocks the scene with its lighter ambience. FMA1’s scoring was always dead-on — one could say an easy task with a overly dramatic production. The same could be said of FMA1’s lack of in-story pop songs, one of which FMA2 unfortunately decides to impose over a fight between Ed’s crew and the immortal legion. It’s a great shame, because this instance dilutes a tense situation formed from FMA2’s strong sense of battle savvy. Scar kills Kimblee in FMA1, and seeing as those characters are involved in separate battles in FMA2, that has to mean something right? Indeed. FMA1 uses Scar avenging his brother’s death to further the personal motives behind conflict, while FMA2 has Heinkel (lion chimera) kill Kimblee as part of a demonstrative effort of human tenacity in the face of adversity. Also of note in this battle is the fact that Pride absorbs the mostly-dead Kimblee, which proves the division of values between warring factions by, in essence, showing that Kimblee is considered evil enough to be welcome to “continue living inside of [Pride].” This act can also be paralleled to hosts swallowing a Philosopher’s Stone and, outside the realm of FMA, reminds me of a scene from the movie “The Prophesy,” where the angel Gabriel is sent to collect the most evil human soul to lead their faction to victory. As always, both featured battles (Ed/Pride/Kimblee and Olivier/Alex/Sloth) are well thought-out and executed, with some wonderful transitions between them. Aside from being adrenaline-inducing candy however, Olivier’s battle features a point where, confronted by Amestrian soldiers after Alex Louis immobilizes Sloth, she attempts to turn ordinary soldiers against their blind patriotism. This manages to keep in line with FMA2s sociopolitical aims and only manages to add to the tense tone of the battle (instead of detracting from it). This proportioning of time dedicated to addressing nominal soldiers is further extended to one of FMA2’s more minor supporting characters, Yoki, who finally gets to play hero while also offering the comic relief.